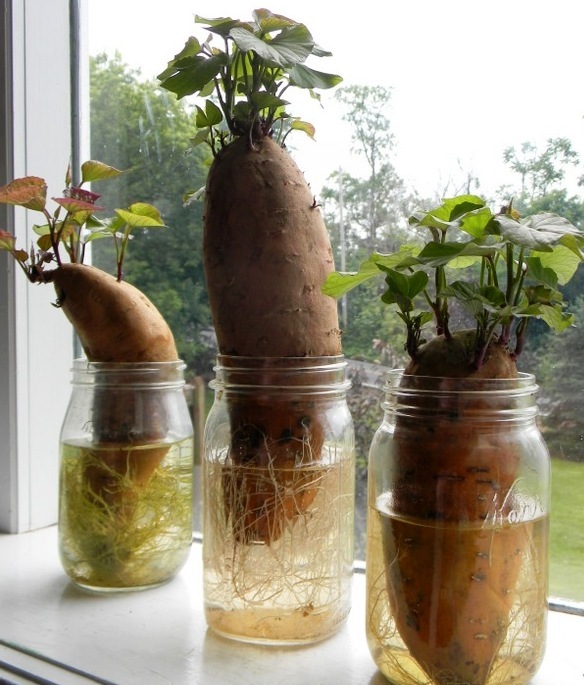 Cultivation of sweet potatoes, which are native to Peru, dates back to 750 BCE. Sweet potatoes are native to Central America and are one of the oldest vegetables known to man. 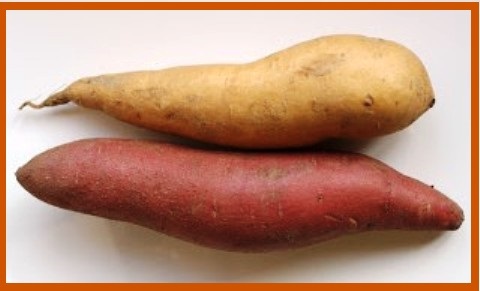 When the sweet potato was introduced to the United States in the 1700s it was given the name “yam” to distinguish it from other sweet potatoes and from the white “Irish” potatoes. These tuberous roots are among the most nutritious foods in the vegetable kingdom. They are packed with calcium, potassium, and vitamins A and C. Sweet potatoes are often confused with yams. Yams are large, starchy roots grown in Africa and Asia. 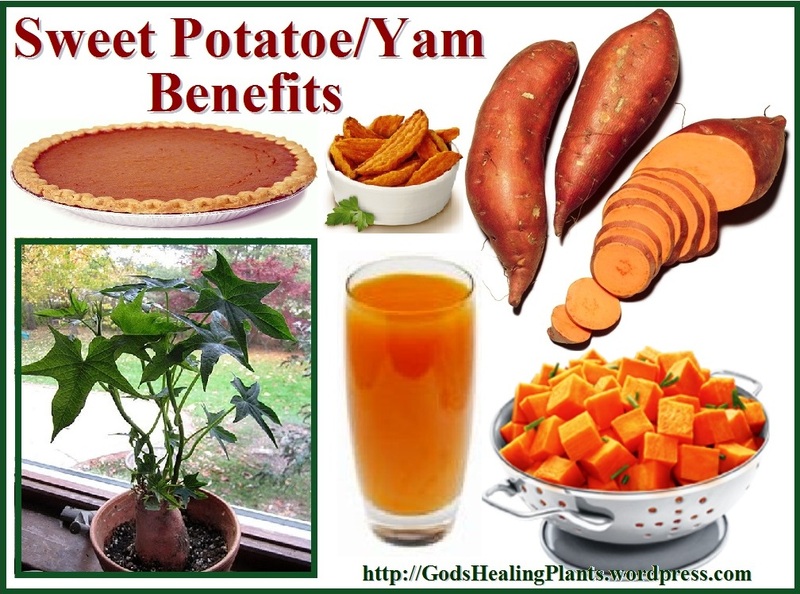 Because of the common use of the term “yam,” it is acceptable to use this term when referring to sweet potatoes. Sweet potatoes contain an enzyme that converts most of its starches into sugars as the potato matures. This sweetness continues to increase during storage and when they are cooked. 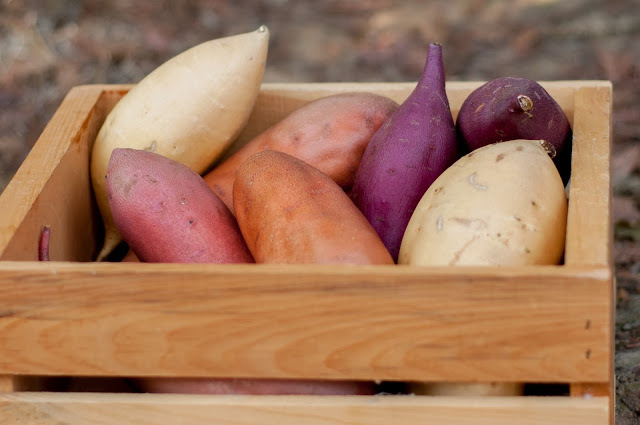 There are about 400 varieties of sweet potato, some more rare than others, differentiated by their skin and flesh color, ranging from cream, yellow, and orange to pink or purple. The many varieties of sweet potatoes (Ipomoea batatas) are members of the morning glory family. The skin color can range from white to yellow, red, purple or brown. The flesh also ranges in color from white to yellow, orange, or orange-red. Sweet potato varieties are classified as either ‘firm’ or ‘soft’. When cooked, those in the ‘firm’ category remain firm, while ‘soft’ varieties become soft and moist. 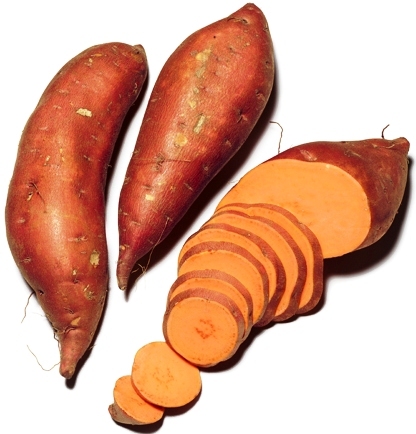 It is the ‘soft’ varieties that are often labeled as yams in the United States. Yams are closely related to lilies and grasses. 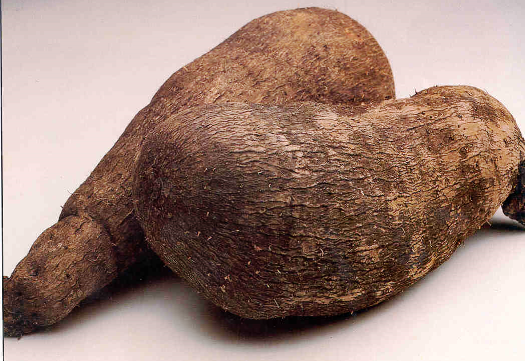 Native to Africa and Asia, yams vary in size from that of a small potato to a record 130 pounds (as of 1999). There are over 600 varieties of yams and 95% of these crops are grown in Africa. 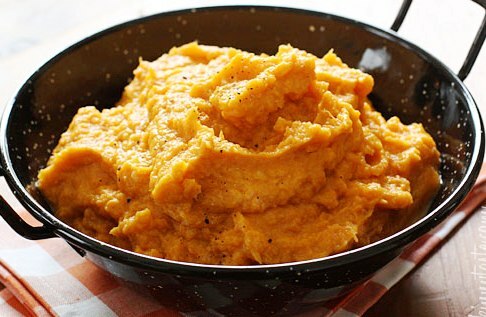 Compared to sweet potatoes, yams are starchier and drier. Sweet potatoes, a super-food, are one of the highest ranked vegetables on the nutrition scale with many established health and well being benefits. They’re high in fiber, Vitamin A, Vitamin C, Vitamin B6, potassium and manganese. Their lower GI index stabilizes blood sugar, which means they’re also a good choice for diabetics. 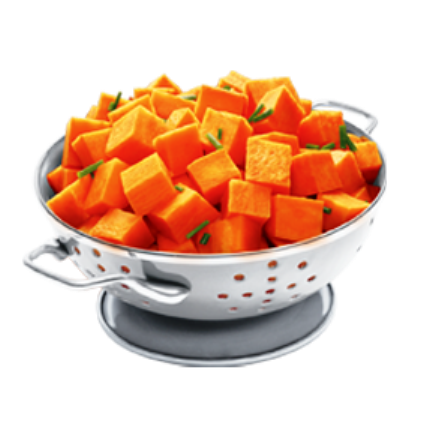 When cooked accordingly, not fried or deep-fried, they are relatively low in calories with an average of 95 calories per sweet potato. 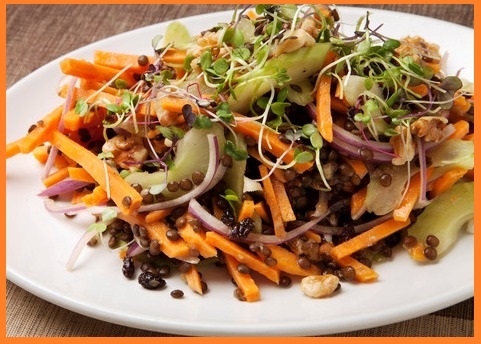 Sweet potatoes are excellent sources of plant proteins with very low calories. Unlike other starchy root vegetables, it is very low in sugar, and in fact is a good blood sugar regulator. Anti-Inflammatory: Sweet potato has anti-inflammatory properties thanks to the vitamin C, vitamin B6, beta-carotene, and manganese it contains. They are just as effective in curing both internal and external inflammations. Lowered inflammation has been shown in brain tissue and nerve tissue throughout the body following the consumption of sweet potato. Anti-oxidant: Sweet potatoes have been found to contain a high amount of anti-oxidant, making it suitable in combating inflammatory problems like asthma, arthritis, gout, etc. 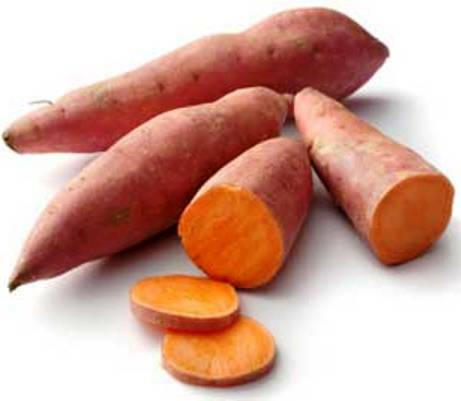 Blood Sugar: The carotenoids in sweet potato can help your body respond to insulin and stabilize your blood sugar. Sweet potatoes also have a significant amount of Vitamin B6, helping resistance to diabetic heart disease. Their high content of soluble fiber aids in lowering both blood sugar and cholesterol, and their abundance of chlorogenic acid may help decrease insulin resistance. Digestive tract, health: The significant amount of dietary fiber, especially when eaten with the skin, helps to promote a healthy digestive tract, relieving constipation and also helps prevent colon cancer. Research has found that they may also help to cleanse heavy metals such as arsenic and mercury from the digestive tract. 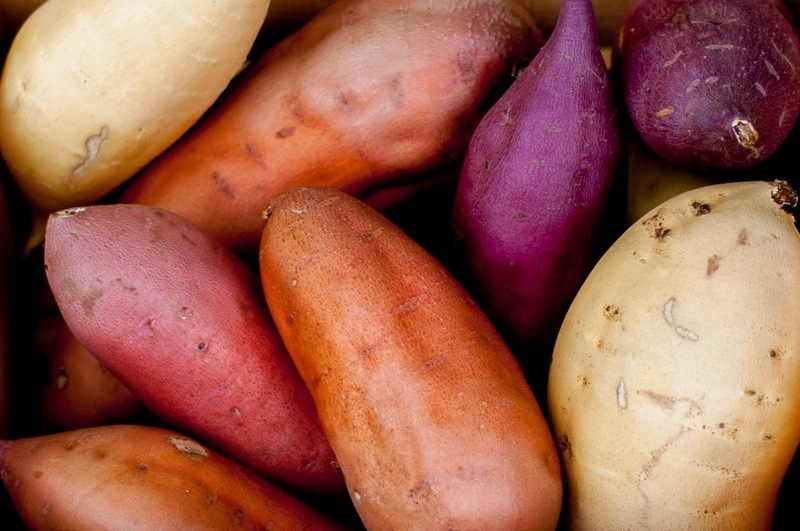 Lower GI: Sweet potatoes also have a lower glycemic index (GI) than regular white potatoes. The glycemic index is a measure of how quickly blood glucose levels rise after eating. Foods that have a lower glycemic index release sugar over a longer period of time, meaning you feel fuller for longer. Eating foods, like the sweet potato, will diminish your hunger and cravings and the consumption of extra calories. Eyes: Take two slices and place them on your eyes. As mentioned before, anthocyanin helps in reducing pigmentation and has anti-inflammatory properties that will help in getting rid of dark circles, wrinkles and puffiness of eyes. Face: Boil sweet potatoes. Let them cool and then mash them. Add a tablespoon of honey and spread this over your face. Let it stay for 20-30 minutes and wash off. You can also add 2-3 teaspoon lemon juice to it in case you have oily skin. Feet: In case you have dry feet and cracked heels, instead of cooling the water in which the sweet potatoes were boiled completely, let it remain a little warm and soak your feet in it. It will help in getting rid of painful cracked heels. Toner: After boiling sweet potato, do not throw away the water. It is packed with nutrients that can help in improving your skin texture and clear your complexion. After boiling sweet potatoes, strain the water. Store this water in a bottle and keep it in the refrigerator to cool down. Use this sweet potato water as a toner for skin. This natural toner will help to absorb impurities, deep cleansing your pores and soothing irritated skin. Sweet potatoes should be stored in a cool, dark and well-ventilated place, where they will keep fresh for up to ten days. Ideally, they should be kept out of the refrigerator in a cool, dry, dark place not above 60°F /15°C. Do not store in plastic bag, make sure they are stored in a cool, dark, and well-ventilated cupboard away from sources of excess heat. NOTE: We never suggest microwaving anything since it kills all the properties leaving nothing but empty calories. Here is a delicious recipe and instructions from “Blue Apron”. Just click on the link below.